Laminitis is as common as colic and needs to be considered a year-round equine welfare concern, according to a study led by Dr Danica Pollard from the Royal Veterinary College. 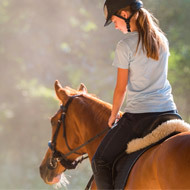 The study published in the Equine Veterinary Journal found that one in 10 ponies developed an episode of laminitis every year, making it just as common as colic. The research was conducted by the Animal Health Trust in collaboration with Rossdales Equine Hospital, and funded by World Horse Welfare. The findings suggest that despite a long-standing belief that laminitis is a spring-time disease, there is no ‘safe’ season and it remains a threat across the UK, no matter the time of year. They also highlight the importance of recognising subtle signs of potentially life-threatening episodes. Most laminitic animals were reported by their owners to display non-specific and mild clinical signs, including difficulty in turning and a short/stilted gait or lameness at walk. Less than half of the animals, however, displayed the more classically recognised signs, such as the typical ‘rocked back on the heels’ laminitis stance and divergent hoof rings. The research also revealed that just half of the 123 owner-reported laminitis episodes were confirmed by a veterinary diagnosis. This shows that many animals with laminitis are not receiving initial veterinary care, despite it being considered a medical emergency. “This includes being vigilant of the perhaps more subtle, but as evidence indicates, also more common clinical signs which are a better representation of the majority of laminitis episodes. The earlier an episode is recognised, the earlier action can be taken to give that animal the best chance of recovery.